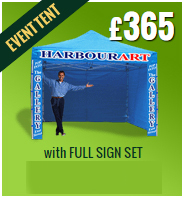 Providing the UK with high quality gazebo's, stands and trade tents. The best place on the web if you are looking for heavy duty gazebos. We offer the largest colour range with over 150 colour combinations and supply all structures with custom signage to give your business greater impact over your competitors… and all at the best possible price. We have specialised in pop up Event Tents and kiosks for many years, supplying our structures to businesses and small traders alike across the UK, Ireland, Europe and USA, and we even have customers as far away as Alice Springs, Australia. Our popularity is due to our product being right for the job having been tried and tested over many years of service, with a framework made in good quality aluminium and then covered with strong 600 denier canvas which is both fireproof and waterproof. 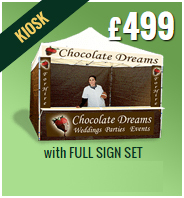 Our in-house design team will provide you with the perfect sign solution to ensure a professional well-presented kiosk or gazebo for your next event, market, car boot or fayre. During the design process we will keep you informed and send visuals of the sign designs for approval. 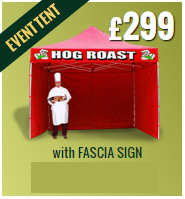 Once you are completely happy with your signs – we print and finish your event tent.